Eurocom is launching the 250 GB Samsung 960 Evo M.2 NVME SSD in fully upgradeable laptops that support M.2 storage. Eurocom is pleased to provide customers with another high-end storage option in our high performance, professional grade laptops and mobile workstations, with the addition of the Samsung 960 Evo M.2 NVMe Solid State Drive. The V-NAND based, M.2 form factor SSDs were built on the Samsung Non-Volatile Memory Express (NVMe) SSD technology. “Eurocom systems are fully configurable and upgradeable so customers can choose the components they need for the project they are working on. From high performance, professional NVIDIA Quadro and Geforce graphics and Intel Xeon processors, to high capacity storage and memory configurations, to 4G/LTE internet on the go support, Eurocom systems are designed to allow users to do what has not been possible with traditional, incapable hardware solutions. Customers come to Eurocom to be set free by their laptop.” Mark Bialic, Eurocom President. Eurocom laptops are used for mission critical applications worldwide, because of this we take security very seriously, the M.2 250GB Samsung 960 Evo M.2 SSD is equipped with AES 256-bit hardware-based encryption for maximum security to keep our customers data safe. Combined with available smart card readers, finger print readers, Kensington lock ports and TPM 2 Modules, Eurocom is doing everything we can to keep your data safe. In select systems customers can choose up to two M.2 drives in RAID 0 or RAID 1. The 960 EVO uses the Peripheral Component Interconnect Express (PCIe) Gen.3 x4 lane interface and is compliant with NVMe specifications to realize effective use of the high-speed PCIe bus and optimize both hardware and software configurations to take advantage of the NVMe SSD technology. The SSD features Samsung Dynamic Thermal Guard technology to manage performance during extreme workloads. 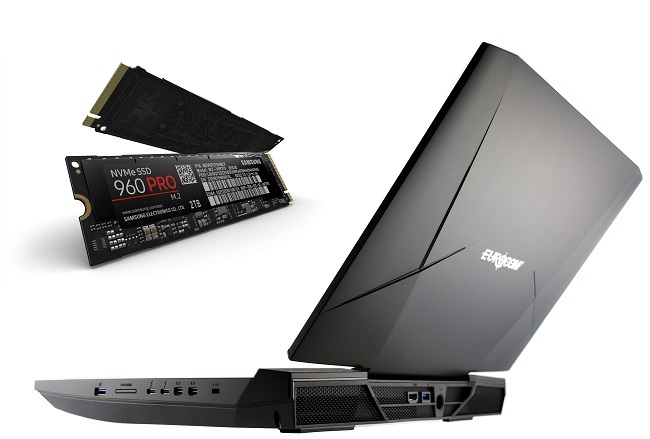 960 EVO M.2 SSD is redefining personal computer performance, partly attributed to the new Samsung Polaris controller which raises the bar of consumer SSD performance.